BEIJING --- President Xi Jinping Friday ordered the Chinese armed forces to enhance their combat readiness from a new starting point and open new ground for developing a strong military. Xi, also general secretary of the Communist Party of China Central Committee and chairman of the Central Military Commission (CMC), made the instruction at a CMC meeting held in Beijing. Hailing the landmark, pioneering and historic military achievements since the 18th CPC National Congress, Xi said the armed forces had resolutely safeguarded national sovereignty, security and development interests and withstood complex situations and severe struggles. "The world is facing a period of major changes never seen in a century, and China is still in an important period of strategic opportunity for development," he said, warning that various risks and challenges were on the rise. The entire armed forces should have a correct understanding of China's security and development trends, enhance their awareness of danger, crisis and war, and make solid efforts on combat preparations in order to accomplish the tasks assigned by the Party and the people, Xi said. 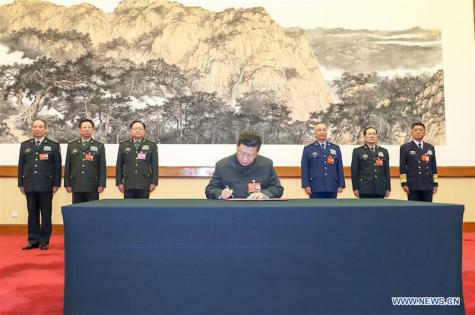 Regarding combat capability as the only and fundamental criterion, Xi ordered all work, forces and resources to focus on military preparedness and ensure a marked progress in this regard. Xi stressed the armed forces' ability to respond quickly and effectively to contingencies, asking them to upgrade commanding capability of joint operations, foster new combat forces, and improve military training under combat conditions. Party and government departments and agencies at the central and local levels are required to support the defense and military development. Xu Qiliang, a CMC vice chairman, presided over the meeting, and Zhang Youxia, the other CMC vice chairman, announced the decision to give awards to 10 model units and 20 model individuals. They received awards from leaders, including Xi. Xi also signed a mobilization order for the training of the armed forces, the CMC's first order in 2019.